Height 5 ft 51/2 in. Weight 133 lb. Chest expansion 33-36 inches. Complexion fair. Eyes grey. Hair brown. Sight 6/6 in both eyes. Hearing, teeth - good. Colour vision correct. Limbs, chest well formed. Full movement in joints. Heart, lungs - normal. Free from hernia, variocele, varicose veins, haemorrhoids, inveterate or contagious skin disease. Vaccinated. Good bodily & mental health; no physical defects. Admitted to Tanherenikau M. Camp Hospital, with measles, on 12 July 1915 (before embarkation). Charles Percy, known as Percy, was the second of three sons of Arthur and Mary Helen (nee GIDDINGS) DORMAN. Born on 3 June 1892 in Uppingham, Rutland, England; he was still resident there with his family in 1901. His father was at that time a stone mason, whereas he engaged in farming in New Zealand. By 1911 the family was residing at Riverview Farm, Fairlie, South Canterbury. 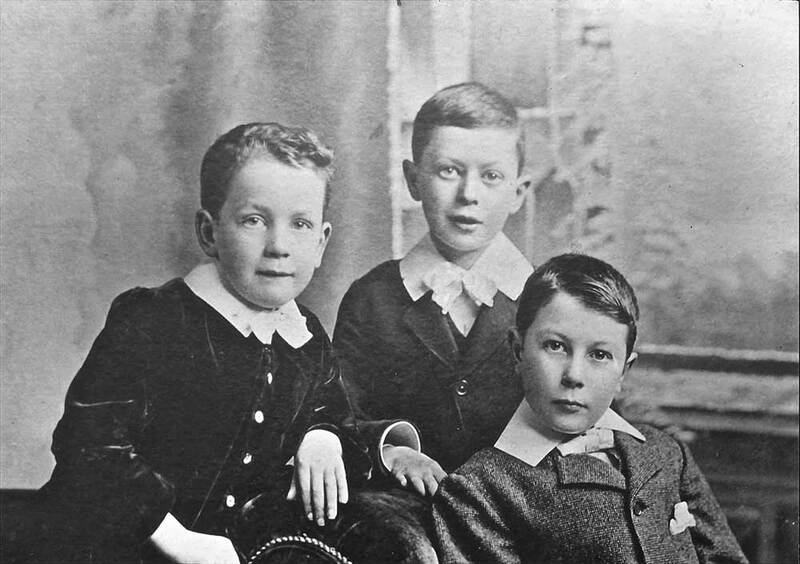 Percy may have come to New Zealand before his parents and younger brother, who arrived in 1910; his older brother died at age 18 in 1908 at Uppingham. Prior to enlistment he had worked as a teamster and then at farming. Percy was one of the last to fall at Gallipoli. During the first evacuation of the Gallipoli Peninsula, on 15 December 1915 while on sentry duty, he was shot by a sniper, the bullet striking him on the left temple. His war experience was quite short-lived and relatively uneventful. He enlisted on 12 June 1915 at Trentham, was admitted to Camp Hospital on 12 July 1915, embarked on 14 August 1915, and was tragically killed in action at the Dardanelles on 18 December 1915 after only two months at the Front. His family was active in patriotic activities in the Fairlie area right from the onset of war until 1920 - Mrs Dorman donated clothing and material in October 1914 and old linen in August 1916; his brother John gave 10 shillings in August 1915; his father Arthur was a member of the Fairlie Social and Reception Committee, formed in connection with departing and returning soldiers (only a few weeks before his son's death he was carting decorations for the hall for a reception for returned men). 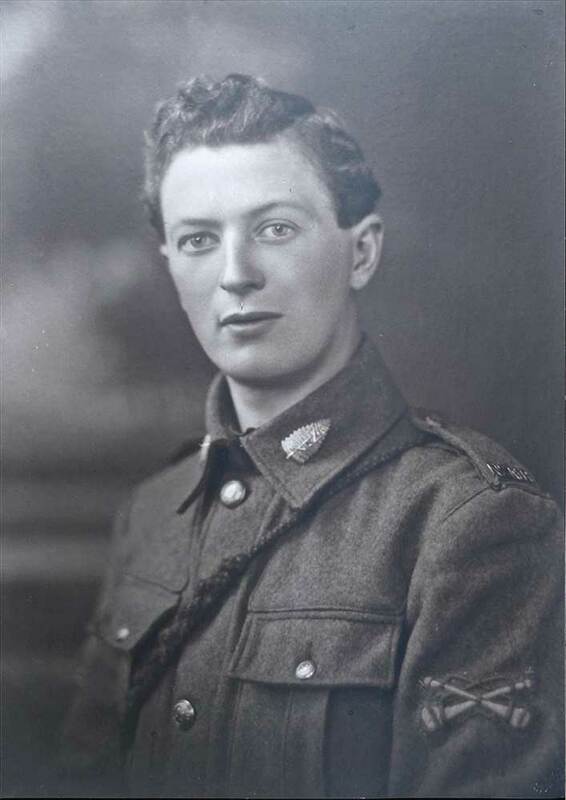 On Sunday, 8 August 1915, at the Fairlie Presbyterian Church, a Roll of Honour was unveiled and the 31 names on it were read out, that of Charles Percy being among them. A memorial window to Trooper C. P. Dorman, presented by his parents, was unveiled and dedicated in St Stephen's Church, Fairlie, during a commemoration service on Anzac Day, 1917. In the annual report of the parish in June 1917, this beautiful gift was described as a 'handsome stained glass window'. It depicts The Good Shepherd and was produced in New Zealand. 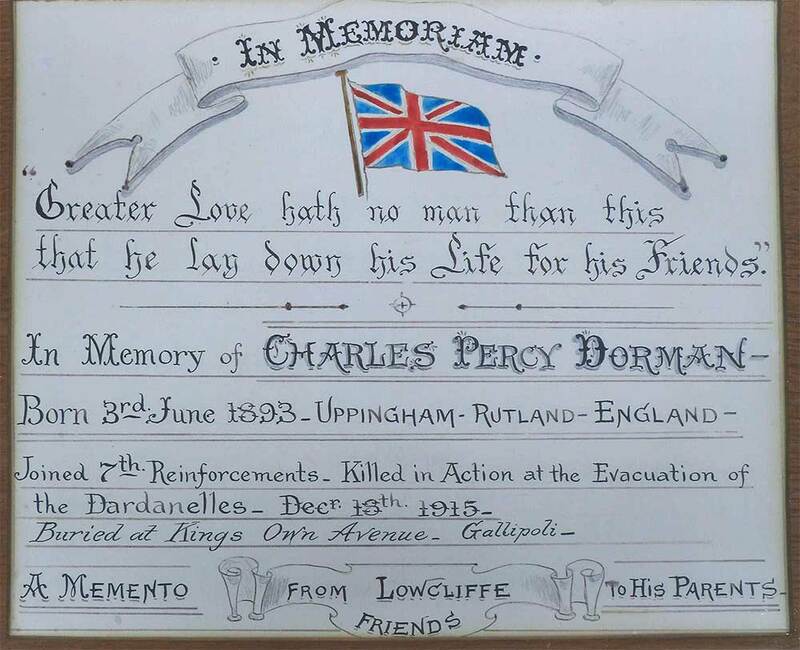 A photo of the memorial window is included in the paper file for Percy. Percy's brother, John William DORMAN, was called up for war service in 1917 but appealed as he was the only surviving son. Percy appeared to have left no will, but his estate was such as to prompt his father to apply to administer; and his father Arthur was duly granted power and authority to do so. The associated legal documents include a certificate of death. His medals, plaque and scroll were sent to his father.